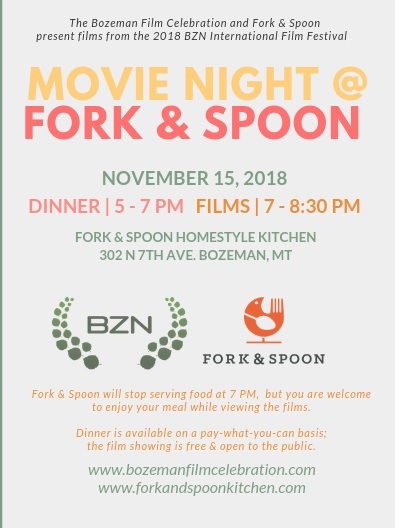 Join Fork & Spoon for it's second Dinner & A Movie night in partnership with the Bozeman Film Celebration on November 15! Dinner will be served from 5 - 7 pm and the film showing & following discussions will begin at 7 pm. Fork & Spoon will stop serving food at 7 pm, but you are welcome to enjoy your meal while viewing the films! Dinner is available on a on a pay what you can basis and the film showings are free & open to the public. 1. Big Booom | 4 mins. An animated story of the history of humanity and of our planet in four minutes. An eco-friendly statement developed in a single shot that has it all: humor, action and tragedy. Promoting Indie Lens Pop-Up, a MontanaPBS film series at Montana State University. "Free Range: The Costains" explores a father and son relationship that was forged in the snowy peaks and rocky singletrack of Montana. Pete Costain has raised his son Parkin with a free-range mentality, allowing him to explore freely but offering guidance along the way. The short film explores Parkin's rise from precocious toddler to pro skier and examines the challenges and benefits of fatherhood in the outdoors. We sat down with both Parkin and Pete to discuss what it was like growing up in Montana, risk in the backcountry, and why you should let your kids run wild. "Free Range: The Costains" is presented by Moonlight Basin and Outdoor Research. Stars of the film will be attending! 4. The Harpist | 11 mins. The Harpist details an evening in the life of young and infamous Emmie Lucas, a world renowned harpist. From the outside, she seems to glitter like gold: fame, beauty, and talent. Yet after her performance, isolation sets in… she reaches for connection only to get shot down, then wanders out alone and comes across a latenight diner. There she finds unexpected connection with a single mom and child and gets pulled out of her own self-pity. Bozeman filmmaker will be attending! 5. Seeking Shelter | 13 mins. Seeking Shelter: a Tiny Home Solution is a documentary short about the HRDC Housing First Village, mixing observational footage showing architecture graduate students and volunteers building a Tiny House Prototype for the HFV Project. The film features interviews with some of the project main players discussing the beneficial impact of the Housing First Village initiative on the Bozeman community and our homeless population. Housing First is a program of the the Human Resource Development Council (HRDC). Montana State University film makers will be attending!